Distillery Lane in Jefferson, Maryland, produces several popular alternatives to sparkling wine. Rob Miller and his wife, Patricia Power, were both working outside of the house that sits on their Frederick County farm in the early 2000s when the farmer who leased their land at the time decided it was time to retire. Miller,who was a financial advisor at this point, says that’s when he and Power decided to try something on their own. Miller and Power converted eleven acres of their farmland into an apple orchard and planted their first 1,000 trees in 2001. Today, the orchard at Distillery Lane Ciderworks produces about forty different types of apples, about one-third of which are specifically for cider. “Our apples are grown like wine grapes. They’re grown for tannins; they’re grown for acidity, for certain flavor profiles; and like wine grapes, a lot of the true cider apples—the bitter sweets and bitter sharps and sharps—are inedible,” said Miller. “You’d be hard pressed to eat one just because of the tannins or the acidity.” Not only are the cider apples grown like wine grapes, but the production of cider is very similar to the production of wine. In fact, Distillery Lane has partnered with area winemakers to help them make sparkling wines utilizing the same equipment used to create the company’s sparkling cider. 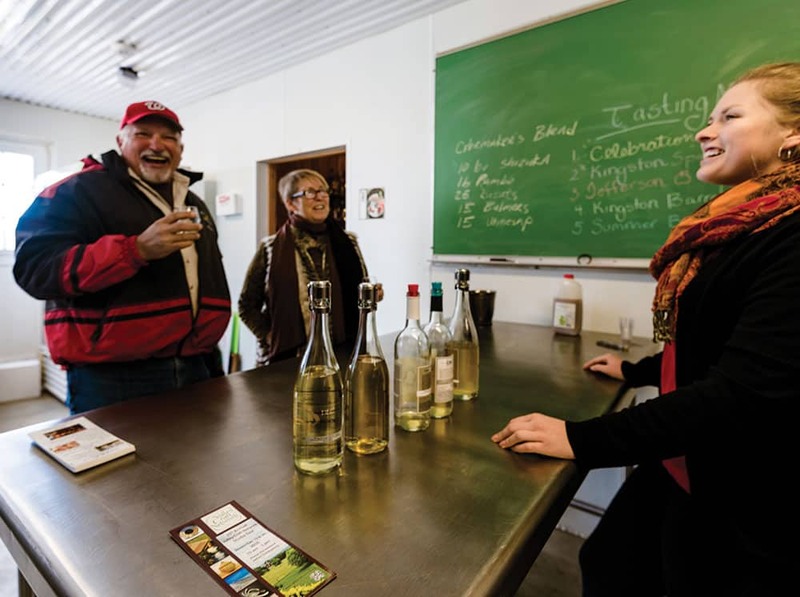 In addition to force carbonating sparkling cider, Distillery Lane also carbonates some of its sparkling ciders by allowing secondary fermentation to occur naturally in the bottle. Miller says that using the second technique produces a dry cider that he especially enjoys. “We do a cider called Traditional Dry Sparkling, and it’s got the very fine bubbles. It’s just lovely carbonation, and it’s fully dry, which is not everybody’s cup of tea, but it certainly is my personal favorite,” he said. Miller says that a lot of customers compare the Traditional Dry Sparkling Cider to a dry prosecco. “It’s very similar,” he said. Distillery Lane also produces a sparkling cider named Woodberry that incorporates aronia berries grown on the premises. It is produced in partnership with the Baltimore restaurant Woodberry Kitchen. And they offer a variety of additional still and sparkling hard ciders from which to choose. The company also grows an impressive selection of apples for more traditional consumption, and it holds events, such as its annual Explorer’s Festival, where visitors can “explore all things orchard related.” This event is held yearly on Columbus Day weekend and includes tours, classes, apple and cider tastings, and more. But cider is the reason Miller and Power got into apple growing, and the company is always looking to offer its customers something unique to enjoy. While there seems to be no end to the number of herbs and spices that people are adding to cider these days – “I saw somebody recently had jalapenos in their cider,” noted Miller – that’s not really what visitors should expect to find when they visit Distillery Lane. “Our niche, if you will, tends to be dry to off-dry with traditional cider-making apples,” he said.